So last year I was lucky enough to enjoy the Val Garland Make up course on line via @Mastered. I was a course that stretched and made me question the path I was on, so when the opportunity to apply to be an Ambassador for them I more than jumped at the chance I positively pounced ! I waited and was contacted to say I had be accepted to be part of this group. Approximately 40 ambassadors globally at this point all looking on how to develop collaboration within their local area, bringing creatives together to inspire, develop and grow the community of artistry. So here I stand with the first and second events already in place and developing. 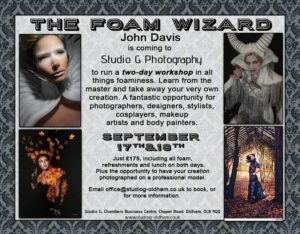 The first a foamy workshop with a gentleman named John Davis based in Wales he uses foam to create and support a variety of fashion to theatrical pieces. The second is a showcase in the Manchester’s mighty Village. 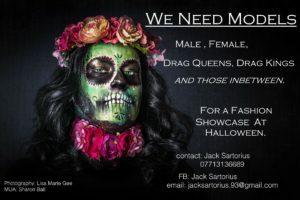 Based at Via on Canal Street My and the amazing Big Dee aka Jack Sartorius will be creating a fashion showcase on Halloween to give a platform for Drag artists, models , MUA’s, hairstylists, fashion designers etc on the 31st itself. Am I nervous oh yes! Am I excited OH YEAH! Do I believe in both these ventures ? With the talent there is out there without a doubt ! !